As I had gone all out with the dark chocolate for the first of my Easter Deserts I decided to make something light and summery as an alternative for those at dinner who weren’t big fans of dark chocolate. Chiffon cake is great to make with Gluten Free Flour, it is light and delicate and works with a lot of different fillings and icings. You could make this sponge and fill it with chocolate buttercream for a beautiful birthday cake or more simply fill it with jam and cream. I have made this sponge in a large rectangular tin and then sliced it to use it for tiramisu and Christmas trifle. It is incredibly versatile and works a dream when adapted for Gluten Free. This recipe is adapted for Gluten Free from Deb Perlman’s site Smitten Kitchen, a treasure trove of delicious recipes. I have made some deserts in the past that I thought were pretty impressive but nothing received as vocal a response as this towering four tiered strawberry and cream confection. The oohs and awws were audible, and although the finish was rough and some of the strawberries I had set aside for decoration had mysteriously vanished people were genuinely thrilled by the height of the cake. It also tasted amazing with the syrup from the strawberries seeping in the sponge and the sweetness of the vanilla flavoured cream keeping everything luscious and light. This is a perfect cake for a Summer Party or for after Sunday dinner. 600 grams of fresh strawberries hulled and thickly sliced. When I make this again I think I will definitely increase the amount of strawberries, I might go so far as to double the quantity. I think the cake can take it. I also think this would be great if you mixed a quantity of soft fruits, raspberries and blueberries with the strawberries. Preheat the oven to Gas 3/ 170 /325°F. • Sift the two Gluten Free flours, 1 1/4 cups of the caster sugar, baking powder and salt together twice into a large bowl. • In a separate bowl, beat the five egg yolks with the water, oil, lemon zest and vanilla on high speed until smooth. • Stir the egg batter into the flour mixture until smooth. • In a clean dry large bowl whisk the eight egg whites with the cream of tartar to the soft peak stage, then add the remaining 1/4 cup sugar, and beat on high speed until the peaks are stiff. Do not over beat the whites of the cake will shrink. • Use a rubber spatula or large flat spoon to fold one-quarter of the egg whites into the cake batter to loosen it slightly, then gently fold in the remaining whites , be gently but keep going until there are no streaks of egg white visible. • Pour the batter into the two prepared tins, making sure the batter is evenly distributed. • Bake for forty to fifty minutes them until the top springs back when lightly pressed and a cake tester inserted in the centre of the cake comes out. • Deb Perlman advises that you check the cakes every five minutes from the thirty five minute mark so you don’t overcook them. • Allow the cakes to cool for at least an hour. • When completely cool run a knife around the inside rim of the pan and turn the cakes out on to a plate. As I need this cake to be ready to serve after an early diner the next day I then wrapped the cakes in a layer of greaseproof paper followed by a layer of tin foil until the following morning. • Macerate the sliced strawberries with the two tablespoons of sugar and the tablespoon of lemon juice for at least an hour before you want to assemble the cake. • Whip the Double cream with the vanilla and the icing sugar, you want the cream to thicken but still be floppy so don’t over whisk. • Carefully split each cake layer in half, leaving you with four cake layers. • Place the bottom layer on your serving plate and spread over some of the macerated strawberries and their juices, this sponge can take the syrup. Cover this layer thickly with one quarter of the cream and place the second cake layer carefully on and repeat this process for the second and third layers making sure to keep one quarter of the cream to coat the top layer. I used all of the macerated strawberries for these three layers and set aside some hulled and quartered strawberries for the top of the cake. • Unfortunately my reserve strawberries were set upon so the top of my cake wasn’t as pretty as I hoped it would be. 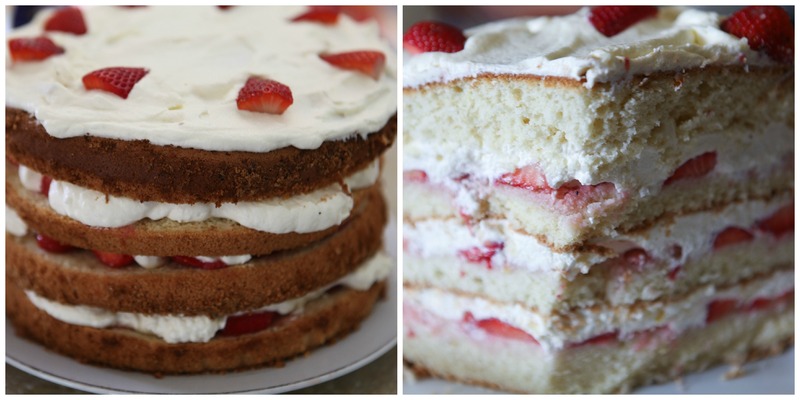 • This is a tall cake but if you can fit it in your fridge it will keep for a few hours and this will allow the juices to seep in to the sponge cake and you will have something like a beautifully light trifle. Otherwise you can set it in a cool place until you serve. I assembled the cake just before dinner was left to sit for about forty minutes but felt it could have done with a little more time. Love chiffon cake. Thanks for sharing!